IoT cellular connections will reach one billion by 2020. IoT is all about data and in this era of IoT revolution, data is the new oil. The growth of IoT and increasing data insecurity are directly proportional. Hence, we expect that this growth will come with some cost and potential for collateral damage. Securing every system fully is practically not possible. However, applying multiple security layers will make it more time consuming and costly for hackers, as cyber-crime is also a business. Protecting data is the priority for every organization and adding a strong security layer such as blockchain may be able to thwart most attacks. Blockchain can be used to improve IoT security. As more and more devices create massive quantities of data and companies aim to leverage IoT to create and employ that data, security and accountability will be major hurdles. The incorporation of blockchain databases into IoT solutions could be one way to ensure that data is secure and that devices are accurately registering and reporting information. Challenges of blockchain in IoT security. In its current form, blockchains are computationally expensive and involve high bandwidth overhead and delays, which are not suitable for IoT devices. Applying cryptography protocols on IoT devices either won’t work or even if it works, it will slow down the devices to the extent of being unusable. IoT devices including wireless sensors, RFID tags, NFC tags, smart cards and M2M microcontrollers, have constraints on the amount of energy available to them. In addition, these IoT devices have very limited RAM and ROM available for cryptography. Hence, IoT devices, especially LPWA IoT devices don’t have the technological capabilities to run cryptography protocols. Being an emerging technology, the major drawback is that most of the countries are still in a dilemma regarding the adoption of the blockchain. Moreover, regulation, standards, and implementation policies are still to be drafted. What does blockchain bring to the table? A blockchain would serve as a public ledger for a huge number of devices, which would no longer need a central hub to mediate communication between them. Instead, the devices would communicate with one another autonomously to manage software updates, bugs, or energy management. Hence, security offered by blockchain would mitigate the need for a central hub for authentication purpose. Blockchain could be used to record just about anything and is not limited to transactional data. Thus, it could be used for managing assets, recording things like device history; maintenance; breakdowns; and ownership. These parameters can often remain unmeasured and result in critical failure due to lack of resources and segregation of records. Merging blockchain and Physical Unclonable Function (PUF) technology will provide more secure authentication of IoT devices. Some start-ups are looking to build blockchain technology into an IoT platform as well. For example, Filament (formerly Pinocchio) provides a decentralized network for IoT sensors to communicate with each other. By encrypting down to the hardware level and leveraging blockchain technology, Filament’s decentralized network stack allows any device to connect, interact, and transact independent of a central authority. ChainAnchor: One of the first blockchain-based IoT frameworks is ChainAnchor, which addresses device security with activation and security layers supported by device makers, data providers, and independent third parties. ChainAnchor adds an anonymous identity verification step using the enhanced privacy ID protocols that allows anyone to read and verify transactions from the blockchain but allows only anonymously verified identities to have their transactions processed. IBM and Samsung: IBM has unveiled a proof of concept known as ADEPT (Autonomous Decentralized Peer-to-Peer Telemetry), which uses blockchain-type technology to form the backbone of a decentralized network of IoT devices. 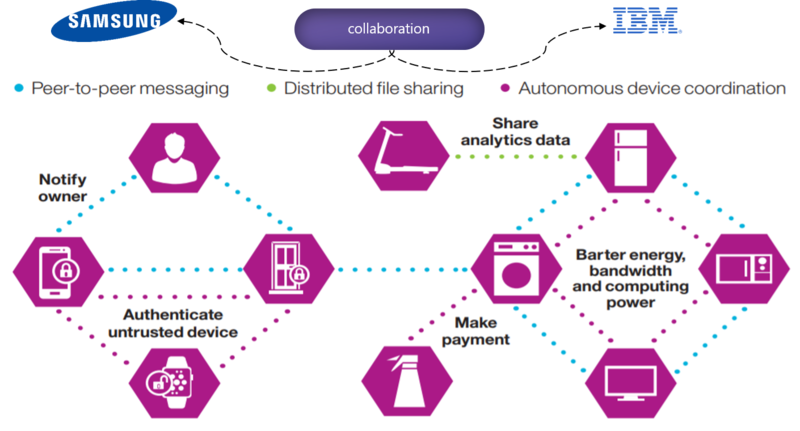 With ADEPT, Samsung has designed a washing machine that uses this IBM framework to order supplies from a vendor automatically. Asset Tracking: A pharmaceutical seal from Chronicled combines NFC chips with blockchain to track and secure prescription drugs. The seal contains secure information about the contents of a prescription bottle, registering the information on a blockchain, whilst also recording the registering party and location data. This tamper-proof technology solution adds a key layer of visibility to pharmaceuticals, allowing patients and physicians to ensure that medication is not counterfeit and provides visibility into the medication supply chain. 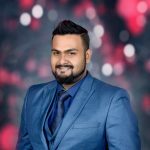 WISeKey International Holding Ltd, a Swiss cybersecurity and IoT solutions company, announced that it has partnered with VIMANA Global, to secure the VIMANA Blockchain Airspace Platform, the blockchain airspace platform for managing Autonomous Aerial Vehicle (AAV) flight, using WISeKey’s Cybersecurity IoT technology. 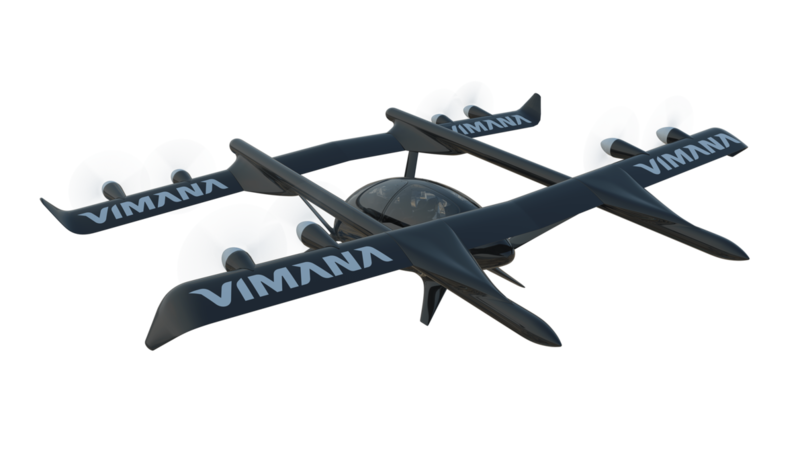 Through the partnership, the VIMANA Blockchain Airspace Platform will be secured by the WISeKey RooT of Trust (RoT) technology for IoT, that combines all the hardware, software, and Trust Model required to take the IoT security to a new level. The WISeKey IoT Blockchain is a vertical security framework, a one-stop-shop security software tool with a user-friendly interface and easy-to-integrate API that manages the life-cycle of devices and their digital certificates. Easy to implement, hard to attack, the WISeKey IoT Blockchain framework offers secure solutions even when the IoT device is in an unsecured environment, such as during production or in the field. Implementation of blockchain for IoT security will be much more challenging, than for Bitcoin in which the blockchain simply moves items of currency from one anonymous owner to another. For IoT, the blockchain will require infrastructure to manage device authentication, security, and control layers, which is considerably more complex. 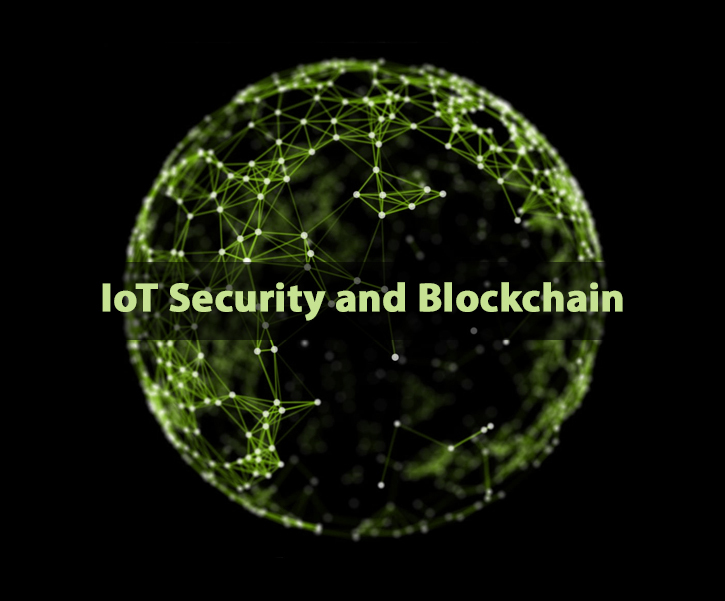 Moreover, for now, blockchain as IoT security is in the very initial stages of development. Having said that, we can also see rapid development of blockchain as a security measure and going forward we expect blockchain to be a powerful and effective tool to protect IoT security and privacy.